© 2018 by CVS/pharmacy®. Prices, promotions, styles and availability may vary by store. Advertised prices good only for date range indicated. Sale prices generally require ExtraCare® card. Prices subject to state and local taxes and fees. We reserve the right to limit quantities on all items or the availability of rain-checks for items where permitted by law. 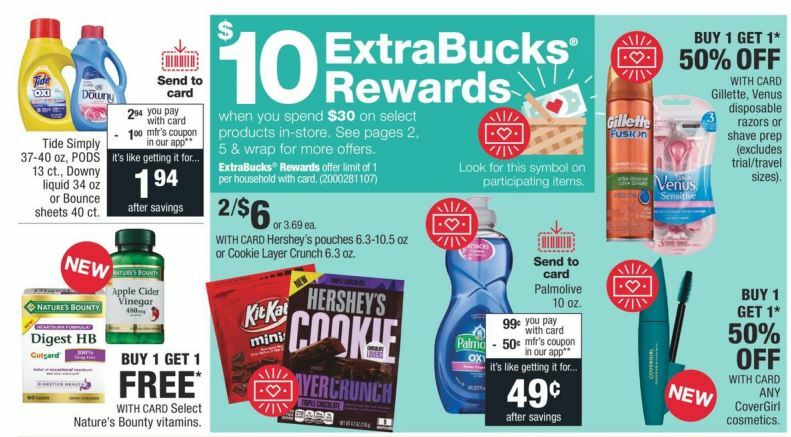 Weekly sale offers are not valid at CVS/Pharmacy® at Target locations. All coupon offers are subject to CVS/pharmacy coupon policy which is available online or in stores. If using multiple coupons, we reserve the right to determine the order in which the coupons are applied. All manufacturer rebate offers limited to one per household unless otherwise stated. Not responsible for typographical or printing errors. All ExtraBucks® offers exclude clearance items. Your ExtraBucks® rewards will print as a coupon on your receipt immediately following qualifying purchase(s).